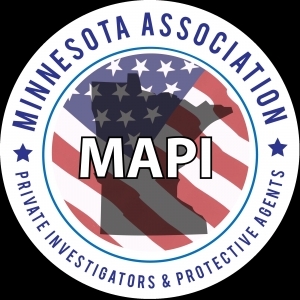 On September 16th, private investigators from across Minnesota will head to Grand Casino Mille Lacs in Onamia, Minnesota for the Minnesota Association of Private Investigators & Protective Agents (MAPI) Fall Conference. The training seminar and networking event offers educational events, door prizes, social events, and more. Up to 12 hour of Minnesota PI and PA Board Continuing Education Credits will be available to attendees. See below for the complete schedule. "Basic Accident Investigation & Reconstruction" with Dan Lofgren of Lofgren Associates, Inc.
"Security 101 for the Private Investigator and Protective Agent in the Field" with Stefan Salmonson of PROtective Services, Inc.
Mr. Salmonson is a MN Licensed Police Officer and Licensed Private Detective and Protective Agent in MN, WI, & SD, with over 30 years Investigative and Security Experience both in the Private Sector and as a former Deputy Sheriff. He is a Certified Personal Protection Specialist, Contract Government Investigator, a Weapons/Tactical Specialist, Professional Speaker, and Airline Transport Pilot. Stefan is a long time MAPI Member and past Presenter, and has numerous Courses approved for C.E.U. credits. Stefan will be providing us with updated information on Security issues for both Security Personnel and Private Detectives relating to recognizing and reacting to potentially dangerous situations in both the workplace and residential settings. He will provide tips on avoiding and de-escalating confrontations with “active shooters”, high risk terminations, and workplace violence, to preventing the dangers associated with dealing with vacant and foreclosed properties, and how to avoid the risks and potential safety concerns that the PI and PA may face with investigating or working around these types of properties. Mr. Hancy has over 30 years of Computer Repair and Support Experience relating to Computer Security issues for both Consumers and the Business Owners. He provides Training in the fields of Computer Security, Computer Repair, and Cyber Crime, and has been a Presenter at previous MAPI Seminars. Dean will provide us with updates on how everyone in the Private Investigation and Protective Agent industries can protect both ourselves and our Client’s Computers and Information from Hackers, Viruses, and other Computer Security related issues. To register for the event, fill out the form and send per instructions here.